Artoo and I began our little adventure just over a year ago. It has been as steep a learning curve as anyone ever suggested it might be. At times it has felt like I was newly diagnosed all over again, and despite 20ish years of experience with injections, there were weeks when that knowledge seemed to count for almost nothing. A year ago I noted that in hindsight, perhaps beginning to completely change insulin delivery method immediately before one of the most challenging and notoriously chaotic times if the year foodwise might seem a little foolhardy. But in the current challenging financial climate it would be a brave man who would turn down the offer of NHS funding for an insulin pump without a very good reason. Last Christmas was, if I'm honest, a bit of a mess BG-wise. Much as I stand by the general assertion among people living with diabetes that there are two days (Christmas and birthdays) on which and any carbs eaten don't count, the perfectionist in me delights in giving myself a kicking whenever dodgy results appear. Even when (and perhaps especially if) I'm sort of expecting them. I didn't get myself into any serious bother last December, but it was certainly not my finest hour. Since the Summer, and especially since changing the sets I use to Silhouettes (with occasional Quickset), Artoo seems to have really got into his stride. I had a pleasant surprise with an A1c improvement at my annual review, and if anything averages and SD have been slightly better since (with the occasional lapse obviously!). I'm not naive enough to expect a Christmas entirely without an errant reading (or 10), but my trust in Artoo's judgement and general ability to accurately correct my mistakes has never been higher. As long as I can weather the basal-tweaking turbulence when the lack of gym visits kicks-in I am hopeful that I might be able to enjoy a few treats here and there over the festive period (along with the inevitable selection of wildly non-standard meals) and still keep a relatively decent hold of things. I can but hope. Thanks to everyone who has visited and commented on our blog this year. It has been an eventful and exciting one in many ways and it has been lovely to share it with you all. Have a brilliant Christmas and here's to unexpectedly good results this festive season and rock-steady BGs for 2013 all round. A short while ago I was musing about one of the questions which form part of the scope of my little side project. It got me thinking, and in order to have a slim chance of having something to say when the subject eventually comes up for discussion I began to wonder just how old people generally are when they are diagnosed with various types of diabetes. In the old days, of course, things were much more straightforward - even the conditions themselves were referred in terms of 'juvenile' and 'maturity' onset. But I'm forever coming across folks in forums who were diagnosed with 'type 1' (which is typically thought of as a condition that develops in childhood) well into their autumn years. There was an obvious answer to satisfy my curiosity - just ask you lot. So I decided to conduct a quick straw poll and asked around the good people of the DOC for their age at diagnosis. Now of course this was not carried out with much, if any scientific rigour - but I find the results fascinating nonetheless. First off I was absolutely humbled and amazed as ever by people's generosity of spirit in the DOC. Within hours of tweeting, "I'm just curious..." I'd been inundated by responses from people who had never heard of me before and my little tweet was bouncing all over the twitosphere with RT after RT. Facebookers and forum peeps waded in and before you could say, "well I wasn't expecting that" I had over 220 responses. Two hundred. And twenty. Many of the 'proper' research projects I see and read have sample populations in the 10s. People even continued to respond for a short while after I'd gathered the results in from the various places. While I recognise that I was asking a particularly skewed demographic, I found it interesting that after logging 70 or 80 anonymised responses into a spreadsheet the proportions of people in the different age groups remained almost entirely unchanged right up until that 221st person chipped in. So while I completely accept the limitations of the survey I do wonder whether it isn't that far off the real picture. The first and perhaps most surprising thing I discovered was that members of the DOC are much more likely to be type 1. I'm not absolutely sure why this is - perhaps because the management of type 2 is often downplayed by healthcare professionals and people are (mistakenly) led to believe that type 2 is somehow 'less serious'. People with type 1 it seems are more likely to feel like they are struggling and to seek help and support online. So while in the UK population type 1's make up only 10% of diabetics, in my survey they represent 72% of responses! Of the type 1's the age at diagnosis ranged from just a few months old right up to 66. Type 2's were similarly stereotype-defying ranging from 17 up to 66 again. The average age for diagnosis with type 1 was 18, while the average age for type 2 diagnosis was 45. I didn't specifically ask the question, but at least a dozen people volunteered the information that they had first been diagnosed as type 2 and later reclassified as type 1 or LADA. The average age for the first diagnosis in this group was 35. It would seem that if you are diagnosed with diabetes in your 30s then you stand the highest chance of your Dr putting a tick in the wrong box, and if the treatment you are receiving isn't working despite your best efforts it might be worth asking for some more tests! So while, as you might expect, over 50% of T1s are diagnosed by the age of 18, almost half of them aren't. Coupled with which the number of people diagnosed with type 2 in their 20s - early 30s is a pretty meagre 15%, with the several of those being later reclassified). One T1 respondent mentioned that at 18 they were told they were 'too old' to be type 1. For another this happened in their mid-20s. It would seem that getting diagnosed at an unusual age is, well... er... not that unusual. I have an appointment on Monday to have bloods taken for my annual review a week or so later. As is often the case the mere hint of an A1c on the horizon has been enough to play havoc with my blood glucose levels over the past few weeks. Coming down with a cold hasn't helped either. This time last year I was at a bit of a turning point. I had tried as hard as I could to improve my levels on MDI, and still felt there was improvement to be made. That review was undertaken at the hospital, and having discussed the ongoing challenges I was trying to tackle, the Registrar agreed that an insulin pump was a good option. I recognise that I am extremely fortunate to attend such a pro-pump clinic and after a few more appointments and a bit more prep, I was pumping before Christmas. Regular readers (your gritty determination astounds me) will know that my journey towards an insulin pump was not entirely straightforward. I spent a great many years resisting the idea each time it was mentioned. Approaching a year into my pump experience I have just done a d-geek 'compare and contrast' exercise that convinces me more than ever of my position on the OCD spectrum - partly because it annoys me so much to have a key period of MDI results missing due to an *ahem* administrative error (I deleted them from one place before checking the place where I thought I'd copied them). I put together seven months worth of BG results side by side, matching 'tricky' periods like Christmas and holidays. I then examined them for a range of markers - BG average, SD, FBG in range, numbers of highs, numbers of lows and so on. Without going into the minutiae (I appreciate I have to at least make a gesture towards allowing you to retain your will to live) the truth is I'm a bit deflated by the results. Since moving to the pump they are, in some ways, better than on MDI - but not really by very much. And if I'm honest I was hoping for the same transformations to my results that I'd seen in other people. People whose MDI skills I hugely respect, whose lives are busy and full of nice varied (and occasionally eyebrow raising) meal choices. People whose A1c's fell by a significant margin after a short time on insulin pump. The trouble is I should be perfectly happy. My meter averages suggest that my A1c will be somewhere in the high 6's. To be disappointed by that seems ridiculous, but my last MDI result was 6.3. It is true that I'm having slightly fewer 'waffy' moments these days (thanks Dave!) but I've also had more readings in the 20s than I can remember thanks to multiple set failures which at one stage seemed to be happening fortnightly. I still believe the pump is working for me - and having changed to Silhouettes a few weeks back I've not had a failure since - but by now I was hoping to have this whole thing sorted and be cruising along with more stability and less goalpost chasing. I'll let you know what the result is when the A1c jury comes back in. Today has been declared 'No D Day' by the original Diabetes Ninja, George Simmons. It's a chance... actually it's a downright order *not* to blog about anything diabetes-related today. To write something else. To share something about who we are and what we like to do. There's more to each of us than just a broken pancreas, pitted fingertips and endless mealtime shenanigans right? I've read some great posts today so thanks to everyone who has shown me more of who they really are. Last year I mentioned that I like watching films. This year, well... I've started painting again. I used to paint years ago, but when the kids came along things got busy and it just sort of slipped by the wayside. 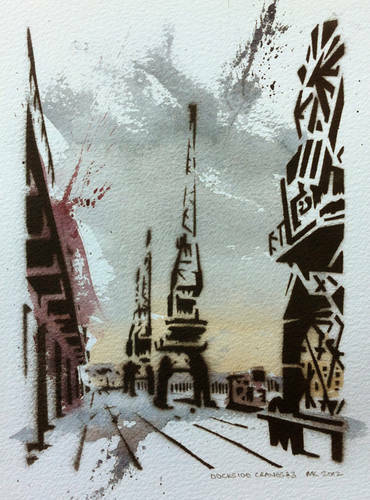 Last year I was experimenting with a spray-stencil for a poster I was doing and had so much fun that I later experimented with using spray-stencil and watercolour together to make an image. I quite liked the feeling of not entirely being in control of the outcome (*struggles to resist drawing a d-related comparison*). 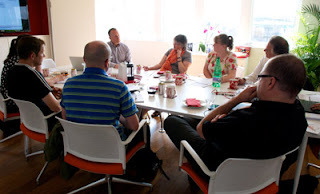 Thanks to Dave (The Tangerine Diabetic) for his excellent writeup of Diabetes UK's Big Event (and also on Shoot Up or Put Up. Following his 'call to arms' I urge you to get involved with the public consultation on food labelling. The consultation ends on 6th August 2012. Have your say here right NOW! Along with approximately 2.5 million other people in the UK I live with diabetes. I am one of the 250,000 or so people with 'type 1', the autoimmune version of the condition. As you may know food plays a pivotal role in the control of both type one and type 2 diabetes and in some senses knowledge about food eaten is as important as any medication taken - even injected insulin. I can't live without insulin, but I can't live without food either! Injected insulin needs to be balanced against the carbohydrate in food (that's all carbohydrate, not just sugar). Getting the 'sums' wrong in either direction can lead to unconsciousness/coma/death on one hand or blindness/kidney failure/amputation etc on the other. Food and diabetes represents a balancing act with both short term and long term perils waiting in the wings. You have to to a LOT of back-of-pack squinting as a person with diabetes. I've been living with Type 1 diabetes for over 20 years and in all that time I can truthfully say that not a morsel of food has passed my lips without first being considered and evaluated in terms of its likely effect on my blood glucose level. I would urge the committee to add more meaningful information to the front or packs by including CARBOHYDRATE rather than just 'sugar'. Even better would be a Glycaemic Index/Glycaemic Load indication (an average figure relating to how fast a food converts to glucose in the bloodstream). Both for people with diabetes and for those without *all* carbohydrate converts to glucose in the blood. What is not well known is that sugar, though it is energy dense, does not convert particularly quickly. Many foodstuffs sold as being 'healthy' and 'slow release energy' are in fact substantially faster to convert to glucose in the blood than sucrose (table sugar). Most 'healthy' breakfast cereals, for example are particularly poor in this regard. While this is of acute interest to those of us who are 'playing at being our own pancreas' it is also very important to everyone. Foods which convert rapidly to glucose cause a burst of insulin release and contribute to weight gain and cholesterol imbalance whether or not one has diabetes. Adding 'Carbohydrate' to pack fronts, and indicating how disruptive a food is in blood glucose terms could be crucial in slowing and/or preventing many hundreds of thousands of people's slide into Type 2 diabetes, and would enormously help the blood glucose control of people already diagnosed. 80% of the NHS budget for diabetes is spent on treating preventable complications - helping people with diabetes make better food choices, and helping others avoid developing diabetes in the first place offers a significant opportunity to save millions and millions of pounds for the NHS at almost no cost. A few weeks back I had my first ever 'Pump Clinic'. I've been in for a few individual appointments, but this was the first (presumably annual) review of how things were going. I had a 'spare' HbA1c that I'd been given at my last 'Annual Review' and decided that this was a pretty good time to play my A1c joker. I was fairly pleased to get a result of 49 (6.6%), though my meter averages suggested it might have been a little lower than that. I am beginning to think that the Contour Link's habit of reading slightly lower than my old Expert means that the conversion I used to use to estimate an HbA1c from meter averages is now a little off. I also had a full lipid panel done (my GP review in March had mistakenly only ordered a total chol figure which is not much use in my book). I was happy to see that my total figure had fallen slightly to 4.7 and the splits remain reassuringly promising (for cholesterol nerds: Total chol 4.7, 1.9HDL/2.5LDL, Trigs 0.6). Fingers crossed my old ticker has a few more years in it yet. I'm not sure if the folks at the pump clinic had just had a particularly challenging morning, but it was lovely to have my Pump DSN and the Consultant who heads the clinic saying such nice things. It may have helped that the basal tests I'd been asked to do in the weeks running up to the appointment (and had been in the process of doing anyway) had fairly spectacularly improved my levels. Artoo and I have been plodding along for 8 or 9 months now, and we seem to have hit a bit of a purple patch. The weeks running up to my appointment were pretty good, and while I've needed to do a little more tweaking since (darned basal goalpoasts on the move again) I've had another few weeks of really good results. I think I'm beginning to see what all the pump fuss is about. During the appointment there were slightly raised eyebrows when my sites were being checked, because of the way I was wearing Artoo. In the first few weeks of having a pump I got increasingly annoyed that the clip on the back only allows the pump to hang vertically on a belt. This meant that Artoo was sitting really high and frequently made his presence felt by digging me in the ribs. He went so far as to draw blood on one occasion when I was getting in and out of a car. Almost all of the 'how do you wear your pump' comments I see on blogs and forums seem to be from women who smugly say how marvellous it is to be able to hang it from their bra. All very well for you lot with your copious cleavages and fancy undergarments, but not much use for me. For blokes it seems to be belts or pockets only. Like some sort of inviolable test of pumping man-dom. Since I have no room for anything else in my pockets I looked around for alternative clips. 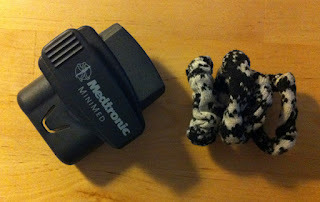 Medtronic do one described as a 'holster' (which appealed to my 8-year-old-Magnificent-Seven-loving self). I duly filled the irritating VAT/account creation paperwork, paid the exorbitant price and waited. Within an hour of eagerly sliding Artoo into it for the first time I knew that it was going to be hopeless. While yes, strictly speaking it does allow the pump to hang horizontally, it only does so with a sort of plastic 'back board' with the clip on which hangs vertically and is exactly the same size as the pump. Not only that, but the twisty mechanism is fairly loose so it's very easy to knock your pump into a wonky angle. Short period of tutting and grumbling. Original clip back on. My solution (and the reason for the raised eyebrow) is pictured on the right of the lamentable 'holster'. It was a £1 scrunchie from Asda (other reasonably priced hair accessory retailers are available). Essentially a long loop of elastic with a cotton cover. Looped three or four times around my belt I can get Artoo to hang perfectly level by passing the clip through the loops. Because it's elasticated I can easily slide him left or right between belt loops, either more on the hip or more toward the front, to suit a seatbelt or whatever. Additionally the little bit of 'give' in the elastic means that I can tilt the screen toward me and read the display right-way-up without any 'having to get out of bag' complexities. Result! I don't know if it is only me who had this struggle finding a the perfect method of positioning their robot counterpart, but if you are still struggling (and getting bruises around the waistline) I'd recommend a £1 scrunchie every time. For the final day of Diabetes Blog Week the prompt is to write about your Diabetic Hero, "anyone you’d like to recognize or admire...". OK, so I've changed my mind *lots* of times about who I should write about. First I thought about some of those stand-out members of the Diabetes Online Community whose blogs, posts, insight, brutal honesty, encouragement and downright laugh-out-loud hilarity that have made such a difference to my experience of living with diabetes - even the ones I have only 'met' this week. Next I felt that I should acknowledge the members of the diabetes forums which have become my immediate go-to whenever I have a problem that is grinding me down, a pattern I can't spot or just need to rant and rage about the overwhelming stupidity and inconsistency of D sometimes. The folks here and here are without question the first place I go whenever I have something that needs fixing, discussing or could do with some ideas bounced around with my control. I find fascinating research papers linked. Thorny issues debated and discussed. New tactics and approaches for improving BG control. For upwards of 15 years I barely spoke to another person with diabetes, aside from maybe one or two 'friends of friends' I bumped into, whose experience of D seemed to be nothing like mine. Before I joined those forums I had almost no understanding of type 2 diabetes. I am so glad that that has changed. I considered acknowledging *everyone* who follows @everydayupsdwns on Twitter. I have lost count of the times my day has been turned around after I've posted a "Blaaaaaaaah! Diabetes is rubbish..." tweet only to receive an instant 140 characters of encouragement from folks in all corners of the globe, day or night. Too many options. Too many people that I would miss out, whoever I chose. Parents of Children with Diabetes. All of them. I was diagnosed in early adulthood (aged 21), but I know some of the psychological impact it had on my parents. My Mum still blames herself and wonders what she did wrong (nothing Mum, really, honestly, truly - nothing). She also still worries which of the grandchildren "might get it now". From the start my family were a huge support and encouragement in coming to terms with my diagnosis. By and large though, I was responsible for my own care. I am now privileged to have two beautiful, inspiring, ferociously clever, teenage daughters. I have watched them grow and blossom. Become amazing people. I know the nagging parental worries connected with anything they ever do. Wanting the very best for them, all the time. I know the emotional wrench of any illness and discomfort they experience. The agony and ecstasy considering of what their future may hold. I know how hard it is to play at being your own pancreas. I know how much of the time the 'rules' make little sense. How hard to have to be on yourself to keep things in control. How some days the weight of possible complications can feel like an unbearable weight to carry. How darned difficult the day to day can be - even when you have your own body senses giving you little tiny clues about levels all the time. I cannot imagine what it takes to play pancreas for your child. All of the difficulty. None of the warning-sign sensory feedback. And all the parental concern about being too harsh/not harsh enough/future health and well-being into the bargain. No doubt. All you guys are complete and utter heroes. Saturday snapshot for day 6 of Diabetes Blog Week makes me think about the photo I posted this time last year. 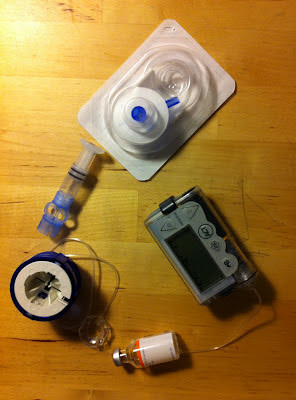 At that stage I was still unsure how I felt about the prospect of an insulin pump - Would it help? What would it be like? How would it feel to live something attached 24 hours a day? This morning I was due a set change for Artoo. A year is a long time. There is more than one type of diabetes. Actually there are *lots* of different sorts, and some of the 'types' are really just umbrella terms for a multitude of different, but fairly closely related conditions. This next bit probably bears saying slowly, because it seems that you have difficulty grasping it: Diabetes. Is. Not. Caused. By. Eating. Sweets. There, that wasn't so hard was it? In general terms you probably only really need to think about type 1 (around 10% of the diabetic population) which is an auto-immune condition where the body destroys it's own insulin-producing beta cells. Nobody knows what causes type 1 diabetes to develop. No-one. On the other hand there is type 2 diabetes, where the proper metabolism of carbohydrate begins to fail. Type 2 Diabetes makes up nearly 90% of the diabetic population and last time I looked *nobody really knows* what triggers its development either. Nobody. There does seem to be a genetic link (so you are more likely to develop it if a close family member already has it). It is also more common in certain ethnic groups. Additionally people who carry more weight seem to be more at risk of developing type 2. Let me say that again - AT RISK. This is not the same as cause. Perhaps 15% of people diagnosed with type 2 are normal weight or under weight at diagnosis. And bear in mind that perhaps 90% of the obese and overweight population do NOT have diabetes. Let's go over what we learned earlier - eating sweets does *not* cause diabetes. If a person is overweight it would be wise for them to consult their doctor to assess their risk of diabetes. The extra weight may be an indication that their metabolism is struggling to efficiently metabolise carbs - but please, please, please stop repeating that diabetes is a 'lifestyle' disease 'caused' by eating sweets. This is getting silly. Please. For the love glittery cupcake-eating unicorns, will you PLEASE just have a two minute conversation with a person with diabetes the next time you have a Brilliant Idea about using insulin-dependent diabetes as a way to spice up your flagging movie/action adventure/medical drama. It really is Not. That. Hard! Time after time you get it wrong at the most basic level. The problem is you get things so messed up so often that 'normal' people will be beginning to think you have it right. You know there's this time-critical thing (a hypo) where the person can be minutes from oblivion. And you know that diabetes has to do with insulin, which is hard to come by on a jet plane struggling to make a landing, while Denzel Washington and Bruce Willis swap oily vests and wisecracks as they wrestle the deranged and inexplicably English-accented baddie into submission. It all looks ideal... How will our rosy-cheeked cherubic child make it through as she plunges into a hypo when the only insulin on board was smashed under the nasty Brit's suspiciously shiny shoe. STOP! Insulin will KILL her. If she is mid-hypo what she need is a little something from the kitchen. Hypo is *low* blood glucose. All she needs is a swig or two of Coke. We are very sorry that this is rather inconvenient in dramatic terms, but there you are. If she misses an insulin shot? Well unless she's on a pump (let's not go there right now) the chances are she has got *hours* - especially if she doesn't stuff her face. She might get a bit grumpy. Not very Hollywood, but I'm afraid it's all you've got. There are all sorts of people. Tall ones, short ones, loud ones, quiet ones. Some are really clever, others not so much. A mixture of all of these people will be unfortunate enough to develop type 2 diabetes. Now given this bewildering variety, don't you think it is perhaps likely that one identical approach will not work perfectly for everyone. Diabetes, perhaps more than any other chronic condition will be affected by the behaviours of the patient. Some people will be happy to take your advice on what foods they should be eating to keep their blood glucose levels under control. You will give them advice based on your knowledge and understanding. What you believe happens 'on average'. The problem is, we are not talking about 'average'. We are talking about individuals. When a patient comes to you with a desire to test their blood glucose levels using an effective framework, and to use those test results to establish a varied and nutritious diet which does not spike their BGs please consider their future health. 80% of the NHS budget for diabetes care goes on treating preventable complications. Once a patient has spent a few months building up a picture of BG friendly foods, testing can drop back to a much lower maintenance level. There is no 'one size fits all'. Don't mistakenly jump to a conclusion of 'non-compliance'. If you are advocating a diet with lots of 'healthy' carbs for t2 patients, their problem might be *too much* compliance. The only way for a person to discover what foods, and quantities they can eat (and at what time of day) is with a meter. Not everyone will want to put the work in, but don't just automatically deny the means for people to control their diabetes. 80% of costs on preventable complications are absolutely appalling stats. Perhaps the time has come, at last, to rethink the high-carb/no-test approach if these are the results you are getting. I'll put it more simply for the hard of thinking: Give. Type. Two. Diabetics. Test. Strips. And. A. Copy. Of. Jennifers. Advice. Then. Support. Them. In. Keeping. Their. Diet. Balanced. And. BG. Friendly. Today's DBlog Week topic is all about fantasy future D gadgetry. If we could have any dream diabetes device, what would it be? I had a crazy notion to write a post about a futuristic BG meter that was actually accurate to within 5% of a lab reading 100% of the time. 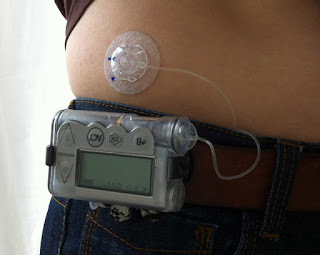 Or maybe a CGM that was actually affordable for anyone that wanted one. I even considered writing about a pump that was constructed with such inexplicable ingenuity that it *didn't* have to bleep and warble about a temporary basal rate Every. Single. Hour. Which might be useful for anyone that ever needed to set a TBR to run overnight and values their sleep. But no. Let's at least keep this within the bounds of the possible. I'm not even going to write about the cure. That's only a mere ten years away after all (well it always has been, ever since I was diagnosed in 1991, so I don't see why we should start changing that now). What I would like to see (and I suspect some white-coated boffin in a gleaming laboratory is already working on this very thing) is an intelligent insulin. I can remember having conversations with people when I was first diagnosed who would say things like, 'Ooooh, I could never inject myself!'. Like that was the hard part. Let's face it after the first three or four hundred - the injections are a doddle. All the other stuff. The adjustment. The guessing games. The carb counting. The unexpected 'helping hand' given by the liver. The moving goalposts. The messy, confusing, illogical variability of it all. That's what I want rid of. Heck, I don't even mind carrying on with a fingerstick BG test every so often just to make sure things are toddling along OK. So in my dream-world of the future, I just need to inject a whack of IntelligentInsulinTM pending every day (it could be every few days, but I don't want to push it). Once absorbed the IntelligentInsulin just sloshes around in my bloodstream bound-up and inert. Ready and waiting. I chance upon a sweet and sickly cupcake. As soon as I start eating it, and my BG begins to rise the IntelligentInsulin senses the change in my levels and immediately begins to work (none of this '4 hour profile' nonsense). Once the carbs are dealt with, IntelligentInsulin stops and waits again. Very tiny amounts of it working every so often to counter glucose released from my liver keeping my levels rock steady. If my BG falls below 4.5 (81), IntelligentInsulin stops working entirely and allows my liver a little room to top things up into a safe zone. When I eat a massive fat-laden uber-carb pizza-with-extra-dough-balls-and-garlic-bread IntelligentInsulin effortlessly matches the stop-start absorption of the food. Even when I have an entire cream-filled Pavlova meringue for dessert. Which is a neat trick since I have a horrendous cold at the time. And have not been to the gym for 2 weeks. All I have to do to manage my diabetes is keep my level of circulating IntelligentInsulin topped up with an occasional injection, and take an occasional BG test to check things are OK. And that is all.